Make it pop! 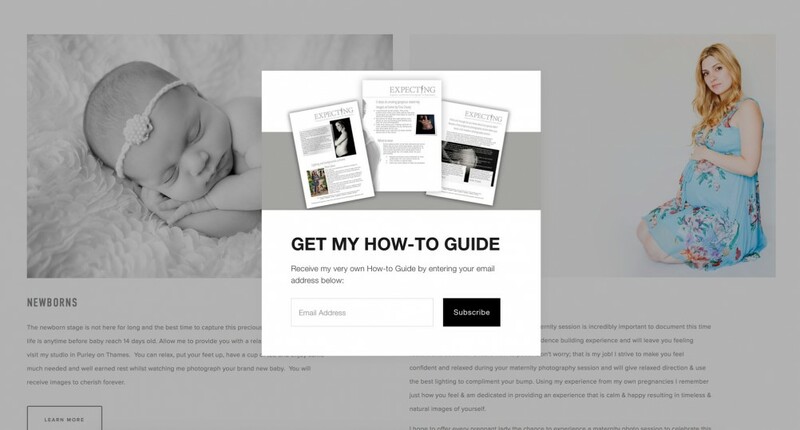 Expecting Photography (shown above) is a great example; after 10seconds on the website a little banner pops up, asking if you would like a free How-To Guide. It only pops up once, the first time you visit the site. Non-Spammy. Nobody wants more junk email… You must reassure potential subscribers that you won’t be sending them an endless stream of mail-outs. Give a clear reason for the subscription. If you use a pop-up banner, ensure it’s only shown once. Clear Incentive. Offer something with real value. Banners offering to “keep you up to date with the latest news” have far lower conversion rates than those offering an incentive with real perceived value. Guides, design templates, plugins and toolkits are the most sought after items. You can find some great ideas in this article here. Attractive & Professional. Ensure your banner looks professional… if the banner looks spammy or poor quality, visitors will assume the same about the incentive being offered.